I can’t see the sun . . .
. . . it is behind smoke that drifts from Amador and Calaveras Counties where uncontrollable flames ravage homes, wildlife, and vegetation. Tim Martinez took the time to make this sign and place it at the edge of his property near the rural area where I live. Thank you, Tim, for sharing and encouraging appreciation for our many heroes. My heart goes out to the residents and to the thousands of firefighters and volunteers who are risking their lives to save others, homes and livestock . . . to stop this hell in the hills. Firefighters do this with skill and passion . . . with HEART. Prayers go out to these heroes and everyone affected by this tragic event. Take a look at John Slot’s Facebook page as he tells the heartbreaking Butte Fire story through his camera lens. 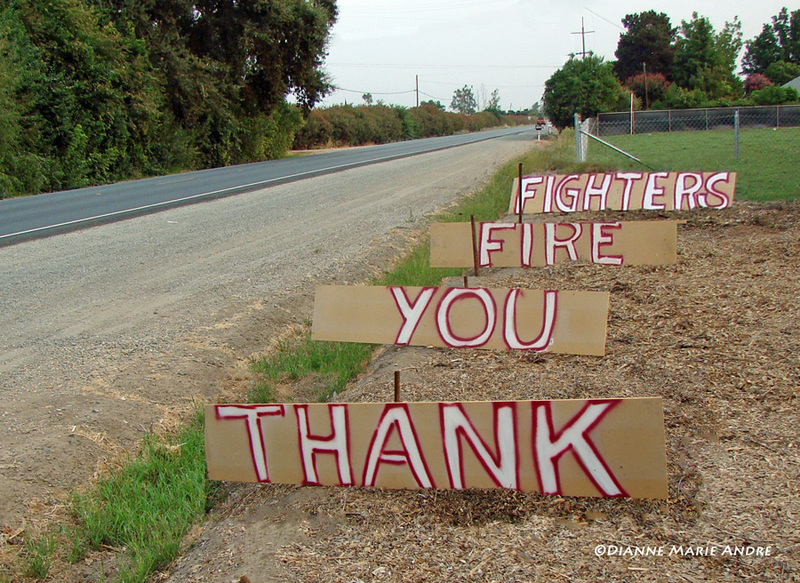 This entry was posted in Blog and tagged Amador, Butte Fire, Calaveras, fire fighters, fire volunteers. Bookmark the permalink.